saint louis | and sure stars shining . . .
1961. The New Orleans hospital in which I was born. 1961. With G-ma Ruth on the steps of my parents’ residence hall at New Orleans Baptist Theological Seminary. 1964. My parents’ rental house in Columbia, Missouri. 1965. The house on Clayton in Columbia — my parents’ first home purchase. On our way to church in Columbia, 1967. I am 5, Karen 3, and Beth a newborn. 1967. The rental house in Hannibal. Inside this rental house in Hannibal. 1969. And just next door, the home my parents purchased in Hannibal. 1971. Lee’s Summit. The home on Wingate, in Briarcroft subdivision. Inside that home on Wingate, my parents are canoodling. 1975. At the piano, in the home on Wingate. 1979. Just before I started college, my parents bought their dream home in Lee’s Summit. 1979. Landen Hall, at Southwest Baptist University. My college home for four years. In my dorm room, decorating a Christmas tree during my freshman year at SBU. I am missing photos of the places I lived during the summers of 1981 and 1982, as I worked in Missouri between college semesters. Summer 1981 was at Southwest Baptist University in the Admissions office; Summer 1982, in Tarkio as a summer missionary. 1983. Willow Springs. My first rental home. 1984. A townhouse in Blue Springs. Townhouse living room. Drab. The painting on the wall is by Aunt Esther. The bookshelf is one I made as a kid. The coffee table was a Mom-&-Pop hand-me-down. 1986. I am missing a photo of the house I rented in Bolivar while I was Director of Admissions at Southwest Baptist University. The building has subsequently been demolished. 1987. A townhouse in Blue Springs, on Arlington Place. I was there four months. 1987. A duplex in Blue Springs, near Highway 7 and I-70. 1988. The first home I ever owned, on Summit Circle in Blue Springs. 1995. Just back from the UK, I rented out my home, and moved into Kansas City, where I lived in a loft in this building in the City Market. 1997. During my time at the University of Kansas, I lived in two different apartments in this townhouse building. Some of the best memories of my life are here. 1999. I am missing a photo of my townhouse in Owensboro, Kentucky, where I taught college for one year. 2000. A gated community in Muncie, Indiana. I lived in a condo in this building for 8 years. At the condo, with students for a final meal as we wrapped up the show choir year: a big pan of canneloni, with Derek Wilson, Luke Meyer, Brian Calvert and mohawk, Amanda Krupinski, Jesse Diaz, Meghan Reiser, and Adam Hendrickson’s arm. 2008. The rental duplex on Alfred Avenue in Saint Louis. At the duplex on Alfred. We were getting rain. And then I bought my own dream home in November 2008. And I’ve been here ever since, with one dog and then another. I like it here. 25 Lawn Place, dressed for the season. Tuesday evening, on the porch swing. The new, 25 Lawn Place, on January 27. Empty porches on Lawn Place. Here’s a bonus: my elementary school in Lee’s Summit. 1971. Pleasant Lea Elementary School. This entry was posted in Augustus Rex, Daily Life, family, Getting older, Life, Moving to St. Louis, Photography for fun, Samson and tagged #WhereIveLived, Blue Springs, Columbia, Coushatta, hannibal, Lawn Place, Lawrence, Muncie, Owensboro, saint louis, Willow Springs on January 24, 2018 by Jeffrey Carter. The Magic Chef Mansion is a Saint Louis treasure. And in this summer of local tourism, I finally made a visit on a cloudy Saturday in August. The globe on this light is a beer barrel design. Mr. Magic Chef’s bits for the drill press. This entry was posted in Daily Life, Moving to St. Louis and tagged Magic Chef Mansion, saint louis, tourism on August 12, 2017 by Jeffrey Carter. So the summer travel is set. I have no big summer trip this year. Since I only have two and a half weeks off after one show closes and the other begins rehearsal, I’m packing in trips on my days off. plus a colleague in Next to Normal at Insight, and Christine Brewer in Albert Herring at Union Avenue Opera. I’ll catch three operas at Opera Theatre of Saint Louis too. This will be a fun summer of some deliberate local tourism. This entry was posted in Daily Life, Musical Theatre, Shows, Travel 2017 and tagged saint louis, travel on May 26, 2017 by Jeffrey Carter. Flags of Valor pays honor and tribute to all American servicemen and women who have fallen in a theater of the war on terror, since 9/11. Their current installation, on Art Hill in Forest Park, marks the 15th anniversary of 9/11. This is powerful, powerful stuff. 7,041 flags. More than 7,000 lives lost in a senseless war that is never going to end. The flowers are for this serviceman. D and I wandered around for a while. I repeatedly choked back tears. This entry was posted in Daily Life, Life, Moving to St. Louis and tagged 9/11, Art Hill, Flags of Valor, saint louis on September 11, 2016 by Jeffrey Carter. For decades, that name has conjured up a picture of Kewpie-doll cuteness, corkscrew-curl hair, fishtail dresses, an eye-catching bosom (indeed! ), and that peculiar but persuasive voice. And last night, for the third time in my life, that conjuring was made real. I’d seen Bernadette in Broadway in A Little Night Music and in Follies. This is the first of her live cabaret-style shows I’ve witnessed. Her 90-minute set, heavy on Sondheim and with Rodgers & Hammerstein thrown in for good reason was a nigh-onto-perfect antidote to a rough week at the office. 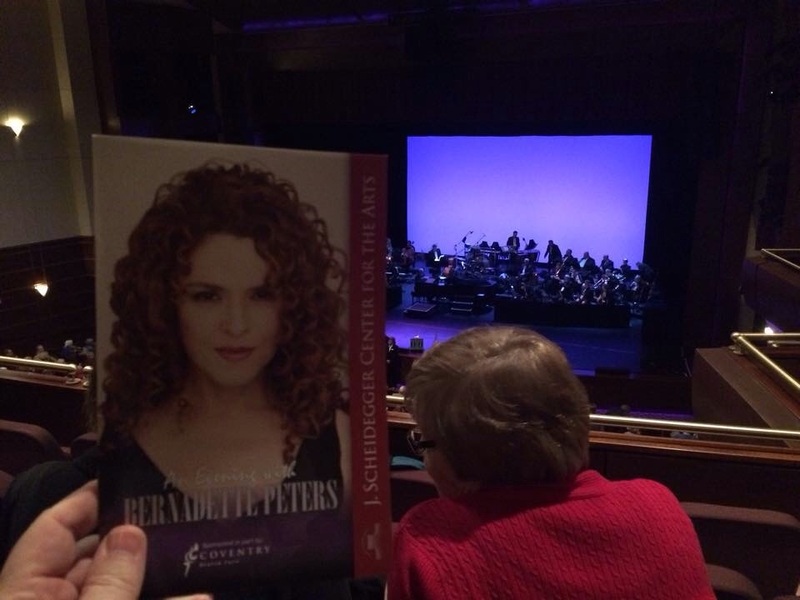 Bernadette performed in Saint Charles . . . she almost slipped and said Saint Louis at one point early on. The folks at the college where she performed lit the show beautifully, which means that Bernadette’s famous pose — head back, arms thrust to the side — was an especially delicious visual button at the end of a star-turn song. The Steve Schenkman Band, a local pick-up group that included two Webster University professors and three of our adjunct faculty members, played with sass and verve if not always perfectly tightly. Bernadette’s own trio (music director at piano, with bass and drums, the latter being played by Cubby from the Mickey Mouse Club) were spot on. Her encore (following close on Sondheim’s “Being Alive”) was a self-written song to support her pet cause about pets. The song, a lullaby to her pet dog, reduced me to tears within the first three short phrases. This entry was posted in Daily Life, Great Artists and tagged Bernadette Peters, Rodgers & Hammerstein, saint louis, Sondheim on February 8, 2015 by Jeffrey Carter. I hosted dinner this evening, and then a bunch of us hit the Balloon Glow in Forest Park. I love this Saint Louis event! This entry was posted in Daily Life, Moving to St. Louis and tagged balloon glow, forest park, saint louis on September 20, 2013 by Jeffrey Carter. This entry was posted in Webster and tagged chamber singers, Gateway Arch, photo shoot, saint louis, webster university on September 18, 2013 by Jeffrey Carter.